IT USED TO relish in its reputation as one of the least customer-friendly companies in the world, but it seems Ryanair has had a change of heart. The airline has announced a series of customer service changes following an in-depth consultation with passengers, including allowing for a second carry-on bag, reduced baggage fees, and the introduction of quiet flights. CEO Michael O’Leary said the moves showed the company was “actively listening and responding” to customers. The cost of having a boarding card reissued at a Ryanair desk in an airport has been cut dramatically from €70 to €15 for customers who have already checked in online but have forgotten to bring their print-out with them – although customers who haven’t checked in online will still have to pay the €70. Passengers will also be able to bring a second handbag-sized carry-on bag on board at no extra cost. The airline has traditionally been extremely strict about only allowing passengers one piece of luggage on board per person. ‘Quiet flights’ will operate before 8 o’clock in the morning and after 9 o’clock at night, in which there will be no announcements over the PA other than the required safety announcements. The lights will also be dimmed on these flights. A frequent customer complaint had been about the noise and interruption on flights as passengers are urged to purchase scratchcards, food and drink via PA announcements. The airline is also getting rid of the much-hated Recaptcha security feature on its website in which customers were required to type two words which were often difficult to distinguish into a text box . Finally, customers will also be given 24 hours after their original booking to correct any minor errors – such as spellings, names and routes – without being charged for it. 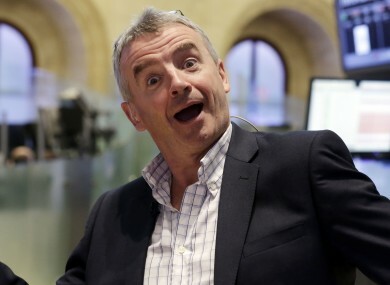 The changes follow on from CEO Michael O’Leary’s admission that he had made mistakes in the company’s approach to customer service. Ryanair spent several weeks getting feedback from customers about what they liked and what they hated about the airline ahead of today’s announcements. “These are the first in a series of customer service improvements which Ryanair is actively working on to make our low fare services easier to access,” said Caroline Green, Ryanair’s Director of Customer Service. Ryanair’s austere approach to customer service has undergone something of a slow reversal in recent weeks, as the company joined Twitter and announced a big redevelopment of its website. The airline is also looking for a new marketing director to help change its image. Email “Ryanair to cut fees and bring in quiet flights. No, seriously. ”. Feedback on “Ryanair to cut fees and bring in quiet flights. No, seriously. ”.